Mark Lucescu , president of Lucescu Realty, an investment real estate services firm, announced the sale of Shadow Mountain Marketplace for $67.25 million. Lucescu Realty represented the interests of the seller, Wynmark Co., and procured the buyer, a private investor. The seller developed the property in 2007 and had owned and managed it since completion. Mark Lucescu, president of Lucescu Realty, an investment real estate services firm, announced the sale of Shadow Mountain Marketplace for $67.25 million. Lucescu Realty represented the interests of the seller, Wynmark Co., and procured the buyer, a private investor. The seller developed the property in 2007 and had owned and managed it since completion. Shadow Mountain Marketplace is a 359,103-square-foot community shopping center anchored by Costco, Seafood City Supermarket, Walgreens, Best Buy and Ashley Furniture. Costco, which features a full-size grocery department, and measures 154,700 square feet, was not a part of the sale. The blue-chip tenant roster also included McDonald’s, Chili’s, Wells Fargo Bank, Panda Express, Subway, Sport Clips, Massage Envy, Wing Nutz, T-Mobile, Best Mattress, Café Rio, Pacific Dental, Kumon Learning Center, Scottrade, Great Harvest Bread Co., State Farm Insurance, H&R Block and Omega Studio Salons. The property is 98.9 percent leased. The Matzinger Institute of Healing, a Henderson-based medical center, purchased its building at 1740 W. Horizon Ridge Parkway in Henderson for $1,609,017. Owned by Carolyn A. Matzinger, M.D., the Matzinger Institute of Healing (MIH) provides a total body wellness program with a membrane and metabolic approach. The principle idea of MIH is to recreate total health by improving the immune system and decreasing inflammation. “While modern medicine leans toward treating the symptoms of conditions adversely affecting health, I founded MIH with the goal of getting to the root cause of medical ailments and circumvent the pitfalls of conventional treatments,” Matzinger said. “MIH utilizes the technology of epigenetics and state-of-the-art membrane treatments with an emphasis on the gut-brain connection. Nevada State Development Corporation, the state’s largest SBA 504 loan provider, assisted with financing for the purchase in partnership with Bank of George. • NAI Vegas’s Sauter Multi-Family Advisors have announced the successful sale of Mi Casitas/Pinewood Crossing, 756 units, located with minutes of the Las Vegas Strip. The properties sold together for $67,700,000, $89,550 per door.The Sauter Multi-Family Advisors consists of Patrick Sauter; Arthur Carll-Tangora; Antone Brazill, CCIM; and Matthew Jenkins. The name of the buyer has not been released. 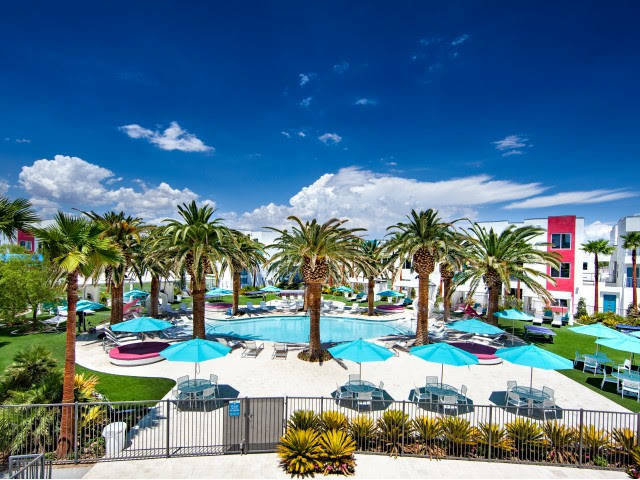 • On behalf of the Watt Cos. and Schulman Properties, Cushman & Wakefield Las Vegas has announced the sale of a multifamily asset, the South Beach Resort apartments. Taylor and Carl Sims were the exclusive agents on the transaction. The sale price was $62 million, or $281,818 per unit. The South Beach Resort is at 8920 West Russell Road, off the I-215 Beltway. • A sale to NR Henderson 215 LLC. The 197,120-square-foot industrial property is within Henderson Interchange Center at 820 Wigwam Parkway in Henderson. The transaction value was $25,100,000. Dan Doherty, SIOR; Paul Sweetland, SIOR; Chris Lane, CCIM; and Jerry Doty of Colliers International represented both the seller, Henderson Interchange LLC., and the buyer. • Kevin Higgins, SIOR, and the National Team of CBRE Inc. represented the seller in the sale of a 215,804-square-foot industrial building at 4640 Nexus Way to Gear 4 Northgate LLC for $24,500,000. • The sale of four multitenant retail pads was completed on Dec. 21. The 30,203-square-foot pads are at 6010, 6070 & 6090 W. Craig Road. The total value of the transaction was $6,194,000. Cathy Jones, CPA, SIOR, CCIM; Paul Miachika; Roy Fritz, CCIM; Jessica Cegavske; and Taylor Vasquez of Sun Commercial Real Estate Inc. represented the buyer, LVAMJT Living Trust of November 28, 2007 and Kite Realty Group represented the seller, KRG Las Vegas Craig LLC. • A sale to E-Z Living LLC. The 12,159-square-foot retail property is in El Mercado at 2885 E. Charleston Blvd. The transaction value was $2,400,000. Chris Clifford, Steve Neiger and Brett Rather of Colliers International represented the seller, El Mercado LLC. • The sale of an Industrial Building was completed on Jan. 4. The 24,000-square-foot property is at 4224 Arcata Way in North Las Vegas. The total value of the transaction was $2,250,000. Cathy Jones, CPA, SIOR, CCIM; Paul Miachika; Roy Fritz, CCIM; Jessica Cegavske; and Taylor Vasquez of Sun Commercial Real Estate Inc. represented the seller, Sage Industrial Holdings LLC and Kase Group represented the buyer, The Scott M. Cooley 1997 Separate Property Trust. • The sale of an office building was completed on Dec. 31. The 12,079-square-foot property is at 2580 Anthem Village Drive in Henderson. The total value of the transaction was $2,200,000. Sun Commercial Real Estate Inc. represented the seller, Corsair Management LP and Realty One Group represented the buyer, Connor & Connor LLC. • A sale to Eziagu Properties LLC. The approximately 6,800-square-foot medical office property is in Parc Place at 5876 S. Pecos Road. The transaction value was $1,145,000. Alexia Crowley, CCIM; Grant Traub, SIOR; and Chris Connell of Colliers International represented the seller, Shalom and Miki Tsubely. • Jason Dittenber; Jerad Roberts; Devin Lee, CCIM; and Robin Willett of Northcap Commercial Multifamily, have announced the recent sale of Summit Estates Apartments for $1,115,000 ($61,944/unit). This sale consisted of 18 multifamily units built in 1972, located at 2131, 2135, 2141, and 2145 Daley Street in North Las Vegas. This transaction had a 16-day escrow which closed on Dec. 28, 2018. Northcap Multifamily represented the buyers (Ambleside Properties LLLP). • The sale of an office building was completed on Dec. 20. The 1,198-square-foot space is at 6725 S. Eastern Ave., Unit 12. The total value of the transaction was $215,000. Renae E. Russo, LEED GA, of Sun Commercial Real Estate Inc. represented the seller, Francis W. & Carol J. Laughlin, ETAL. • Kevin Higgins, SIOR, of CBRE Inc. represented the buyer, PKM Properties LLC, in the purchase of a 5,000-square-foot industrial building at 4025 Nevso Drive for $1,550,00 . • Kian Khan LLC dba Griddlecakes leased 2,478 square feet of retail space at 4165 S. Grand Canyon Drive, Ste 102, from Grand Canyon Center, LP. Total consideration was $355,345. Managing Director Michael Zobrist and Executive Managing Director Nelson Tressler of Newmark Knight Frank represented the lessor in the transaction.• The lease with Kenpo 5.0 was completed on Dec. 19. The 3,780-square-foot retail space is at 8645 W. Flamingo Road, Suites 102-104. The total value of the transaction was $288,960. Paul and Wil Chaffee and John Kirtley of Sun Commercial Real Estate Inc. represented the tenant, Kenpo 5.0 and Masters Realty Eastern Group represented the landlord, Jun Son Yoo. • The lease with Frayne Robert Johnson was completed on Dec. 27. The 2,721-square-foot office space is at 411 Max Court in Henderson. The total value of the transaction was $155,777.25. Lisa Hauger and Timothy Erickson of Sun Commercial Real Estate Inc. represented the landlord, RSA Avanti Max LLC. • Vijay Gandhi dba Hollywood Smokes and Vapes leased 1,600 square feet of retail space at 237 N. Stephanie St., suite D, from Stephanie Promenade LLC. Total consideration was $155,520. Managing Director Michael Zobrist and Executive Managing Director Nelson Tressler of Newmark Knight Frank represented the lessor in the transaction. • Vivo Vision Inc dba Vivo Vision leased 1,404 square feet of retail space at 4750 W. Sahara Ave., suite 2, from Sahara 3D LLC. Total consideration was $140,640. Managing Director Michael Zobrist and Executive Managing Director Nelson Tressler of Newmark Knight Frank represented the lessor in the transaction. • Talley, Inc. leased 17,108 square feet of industrial space in Craig Commerce Center at 2629 E. Craig Road. Zac Zaher of CBRE represented the tenant. • Exel Inc. leased approximately 313,668 square feet of industrial space in Northgate Distribution Center at 5430 Donovan Way. Kevin Higgins, SIOR, of CBRE represented the tenant. • A lease to Sierra Metals Southwest LLC. The approximately 24,500-square-foot industrial property is in Oquendo Warehouse at 3555 W. Oquendo Road, Suite C.Spencer Pinter; Dan Doherty, SIOR; Paul Sweetland, SIOR; Chris Lane, CCIM; and Jerry Doty of Colliers International represented the lessor, Bracket Company LLC. • A lease to B&K Technology Solutions. The approximately 18,750-square-foot industrial property is in Blue Diamond Business Center No. 5 at 4120 W. Windmill Lane, Suite 105. Susan Borst, CCIM, SIOR; Dan Doherty, SIOR; Paul Sweetland, SIOR; Chris Lane, CCIM; and Jerry Doty of Colliers International represented the lessor, Pacifica Blue Diamond V LLC. • A lease to Henderson Engineers Inc. The 6,721-square-foot office property is in Centra Point at the Curve at 8311 W. Sunset Road, Suite 240. Grant Traub, SIOR, and Chris Connell of Colliers International represented the lessee. • A lease to Budget Mail. The 2,320-square-foot industrial property is in PACE Commerce Center at 5140 Rogers St., Suite C. Dean Willmore, SIOR, and Mike Willmore of Colliers International represented the lessor, FJM Vegas Holdings LLC. • A lease to Garden Grill LLC. The approximately 1,300-square-foot retail property is in Summerlin Gateway at 7500 W. Lake Mead Blvd. Al Twainy, CCIM, of Colliers International represented the lessor, Gateway Plaza 31 LLC. • EveryPet LLC leased 43,916 square feet of industrial space in Harsch Speedway Commerce Center III at 6335 N. Hollywood Blvd. Sean Zaher of CBRE represented the tenant. The property closed on Feb. 8. The total sales price is $67.7 million. The agents represented the buyer and seller. • B & J Rentals LTD leased approximately 5,814 square feet of industrial space on 5th & Gilmore Business Park at 3670 N. 5th St. Sean Zaher of CBRE represented the tenant. • Breeze Daiquiri Bar LLC leased approximately 10,292 square feet of industrial space in Lamb Business Park at 4305 N. Lamb Blvd. Zac Zaher of CBRE represented the landlord. • Mears Group Inc. leased approximately 6,750 square feet of industrial at 4880 E. Carey Ave. Sean Zaher of CBRE represented the landlord. • ESP Gaming LLC leased approximately 16,303 square feet of industrial space in Harmon Warehouse Center at 4301 S. Valley View Blvd. Zac Zaher of CBRE represented the landlord. • A lease to Advanced Practice Nursing Specialists LLC. The 7,604-square-foot medical office property is in Mountain View Professional Plaza at 2851 N. Tenaya Way, Suite 101. Andrew Kilduff of Colliers International represented the lessor, Denee Mountaview LLC & MJ. Stacy Scheer, CCIM, of Colliers International represented the lessee, Advanced Practice Nursing Specialists LLC. • A lease to Access Solutions LLC. The approximately 6,500-square-foot industrial property is in Blue Diamond Business Center, Building 2 at 4280 W. Windmill Lane, suite 103. Susan Borst, CCIM, SIOR; Dan Doherty, SIOR; Paul Sweetland, SIOR; Chris Lane, CCIM; and Jerry Doty of Colliers International represented the lessor, Pacifica Blue Diamond II LLC. • A lease to Team Construction Management LLC. The 6,238-square-foot industrial property is in Wagon Trail at 4435 Wagon Trail Ave. Dan Doherty, SIOR; Paul Sweetland, SIOR; Chris Lane, CCIM; and Jerry Doty of Colliers International represented the lessor, Boreal LLC. • A lease to Kyung Chang Industry. The 4,008-square-foot industrial property is in Civic Center Corporate Park at 3870 Civic Center Drive in North Las Vegas. Dan Doherty, SIOR; Paul Sweetland, SIOR; Chris Lane, CCIM; and Jerry Doty of Colliers International represented the lessor, MCA Civic Center II LLC. • A lease to Rincon Technology Inc. The approximately 100,000-square-foot industrial property isin Sunset Parkway (Bldg. 2) at 6670 S. Valley View Blvd. Spencer Pinter of Colliers International represented the lessee. • A lease to Total Transportation Logistics Inc. The approximately 75,000-square-foot industrial property is in Blue Diamond Business Center No. 5 at 4120 W. Windmill Lane. Susan Borst, CCIM, SIOR; Dan Doherty, SIOR; Paul Sweetland, SIOR; Chris Lane, CCIM; and Jerry Doty of Colliers International represented the lessor, Pacifica Blue Diamond V LLC. Spencer Pinter of Colliers International represented the lessee. • A lease to Assured Healthcare Systems LLC. The 14,942-square-foot medical office property is in Partell Medical Center at 2870 S. Maryland Parkway. Alexia Crowley, CCIM, and Stacy Scheer, CCIM of Colliers International represented the lessor, Welltower OM Group LLC. • A lease to Expeditors International of Washington. The 9,265-square-foot industrial property is in Arrowhead Commerce Center (Bldg. 4) at 3585 E. Patrick Lane, suite 500 & 600. Spencer Pinter; Dan Doherty, SIOR; Paul Sweetland, SIOR; Chris Lane, CCIM; and Jerry Doty of Colliers International represented the lessor, KTR LV IV LLC. • A lease to Donald E. McNabb Co. The 8,007-square-foot industrial property is in Valley View Corporate Center (Phase I) at 6283 S. Valley View Blvd., Suite A. Spencer Pinter of Colliers International represented the lessor, Valley View LLC.